"Hi ! We're from the German Bishops' Conference and we're here to help!" Mr. Voris predicts a "Fur-Flying Free-for-All." Should be interesting. Hold on to your seats! 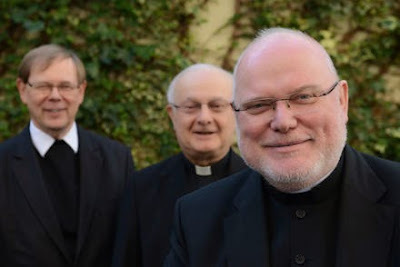 "Full text: German Bishops' Conference explains change in labor laws allowing for employment of homosexuals in 'civil unions'" (Rorate Caeli, May 5, 2015). Do you think the German Bishops would be discouraged were they to learn that the SSPX beat them to the communion-for-adulterers punch? One can be sure they have no idea that Lefevbre and Fellay established secret tribunals (now exposed) that supplanted the universal jurisdiction of the Pope and that these Tribunals usurped the authority/judgment of The Roman Rota with the crazy consequence that the SSPX issues faux decrees of nullity so Tommy Trad can ditch his neo-cath wife and marry Tammy Trad who also has received a faux decree of nullity from her neo-cath hubby from these nuts and so then the new-newly wed adulterers, Tommy and Tammy, receive communion in some sspx chapel. So, the upshot is, the German Bishop are thousands of days late and countless euros short of being on the cutting edge of dispensing communion to adulterers. 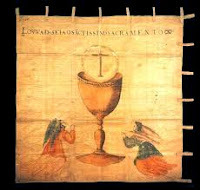 The difference is, whatever is done by 'tradies' and 'throwbacks' like the SSPX is by definition 'reactionary', wrong-headed', and 'eye-roll-worthy', whereas whatever is done by the Rhineland bishops, with or without the collaboration of the pope, is 'enlightened', 'forward-thinking', 'pastoral', 'spiritually-insightful', and worthy of congratulation (or at least self-congratulation) and will sooner or later be mainstreamed throughout the Conciliar church. Dear Clement. Raider Fan thinks a popular weight loss program - deflate watchers * - will develop before the Synod approves communion for adulterers. * Fridays are always a good time for oblique references to sports. I don't know that "communion for adulterers" will be officially adopted, though in practice it's been around for decades. The Rhineland bishops hijacked the council and it's "implementation" afterwards, and we already have scads of practices that would have unthinkable under Pius XII accepted as though they were perfectly katholisch, ja-ja, and perfectly heretical ideas believed by the vast majority of Katholiken in "full communion" and good standing by likes of Papa Bergoglio who tells them, "just go ahead, make a mess, and received communion anyway," or Judas in "full communion" and good standing who tell the public that "all are welcome here" even if they are gay flag waving sodomites in drag. Welcome to McAmChurch, a church in "full communion" with the Holy See under bishops in direct succession from the Holy Apostles themselves.